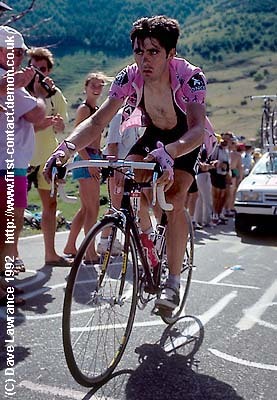 Laurent Jalabert at Alpe d'Huez. In the days before he became world No.1, Laurent Jalabert struggled as much as any of the riders in the high mountains. (Here seen suffering at Alpe d'Huez). Though his climbing has improved tremendously, it remains to be seen whether he will ever be a realistic Tour de France challenger. Though 1997 has not been one of his best years, he has finished it strongly with a good ride in the Vuelta d'Espagne, followed up with wins in the World time trial championships and the Tour of Lombardy.